I have been wanting to visit and take photos of my friend Laurie’s house forever. She lives in a small town about 45 minutes away and was still in the midst of remodeling for much of the last year so I couldn’t really just pop on over with my camera, but since her husband got a job offer that will require them to move she wrapped up the remodeling projects and invited some friends over for a play date. I showed up a little early to snap some photos before toddler chaos ensued. Laurie’s house was built in the 1930′s and is located in the heart of a small town (so small that if I named it specifically you could definitely find her house, so I’ll keep it vague for privacy’s sake). 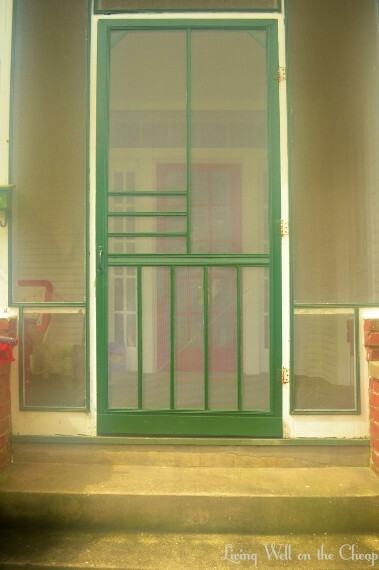 It had been vacant for over a year when they bought it and needed a LOT of work. 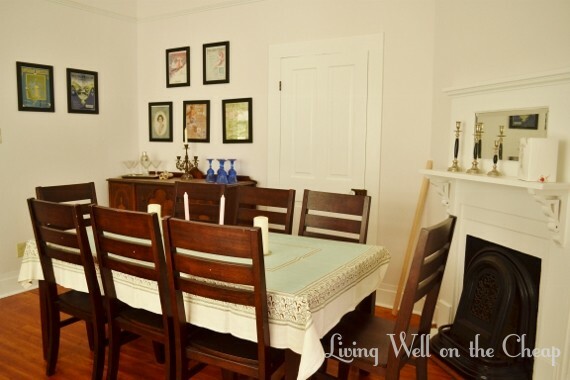 Laurie has a master’s in Historic Preservation so she kept original features wherever she could and respected the home’s integrity where new work was needed. 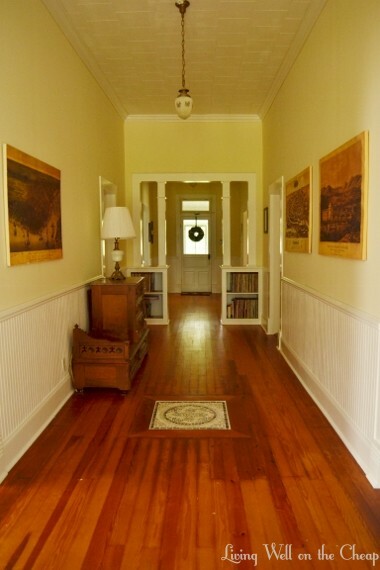 A center hall is one of those things that’s rarely seen in newer homes but I just love. I know it’s impractical, a waste of space, but so classic! You can see from the front door straight to the back, with living areas to the left and bedrooms to the right. I love the tile inlay in the middle of the floor! Just inside the door Laurie has this collection of family photos. This is totally what I was going for with my frame wall. Maybe I shouldn’t have been so zealous with the straight edges. Laurie puts a lot of effort into hunting for interesting pieces. That is actually an antique radio there in the right corner! 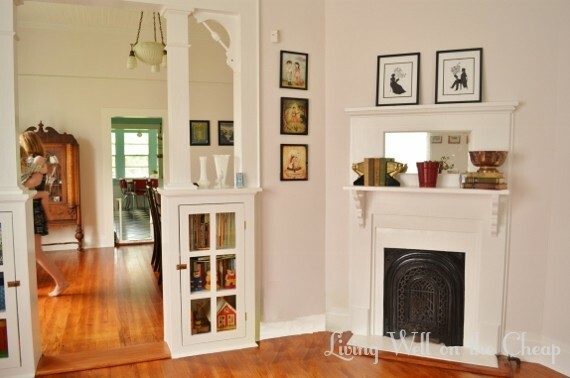 This house has amazing architectural features. Lots of original built-ins, beadboard, mouldings, etc. And I love that the living and dining areas are connected without the less cozy “open plan” effect. 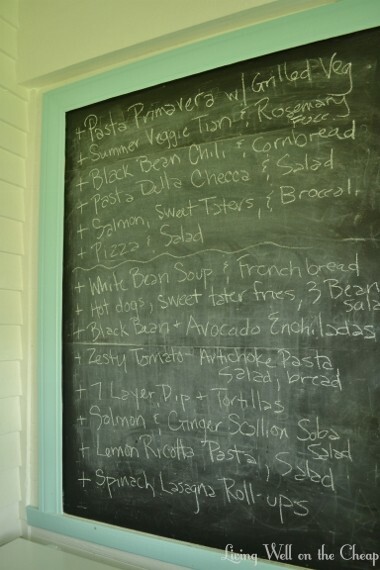 Laurie collects vintage tablecloths and has a huge stash stored in the buffet. I later spilled a bit of enchilada casserole on this lovely one–I hope she was able to get it out! How beautiful is that dining set? 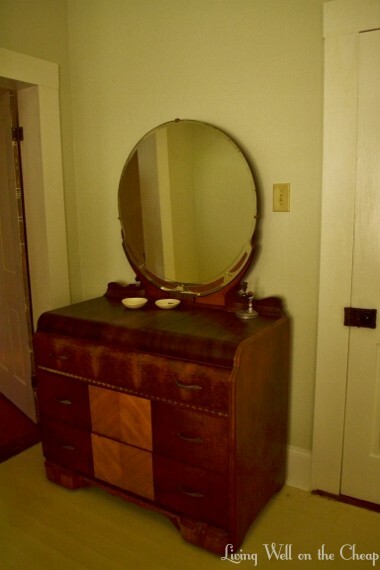 She’s collected all of her furniture over time from various antique and thrift shops, estate sales, etc. Only a couple of pieces, like her sofa, were purchased new. 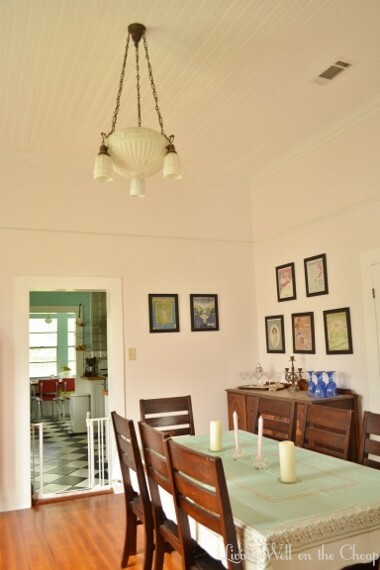 The ceiling and light fixture in here are original to the house. So beautiful! And can you believe those twelve foot ceilings? Definitely on my wish list for my future dream house. 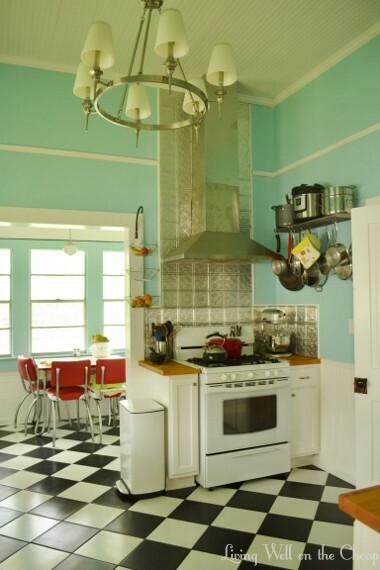 How retro-chic is this kitchen? 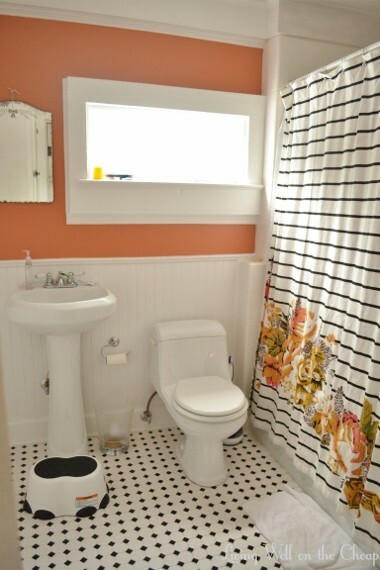 Laurie did all the tile work in the house herself, including this classic black and white ceramic floor. 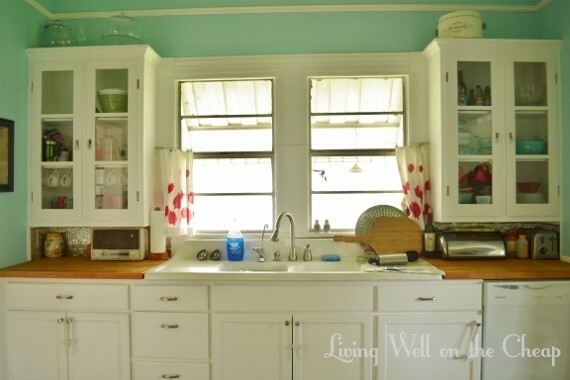 The upper cabinets and the sink are original to the house, but the countertop is Ikea butcher block and the lower cabinets are from the Home Depot. I totally covet that vintage kitchen radio. Laurie is also an amazing cook. She’s a woman of many talents! I think that this little area they use as a breakfast nook was a porch at some point, but has been closed in. 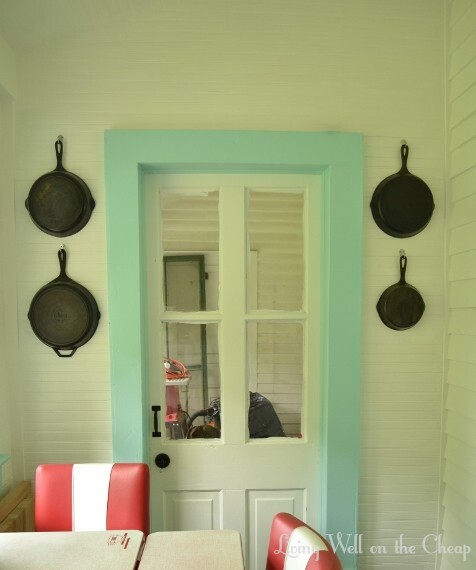 I love the simple contrast of cast iron pans hung on a white wall. Laurie is really proud of the work they did in the bathrooms, and with good reason. This was originally just a tub with no shower and a drywall surround. 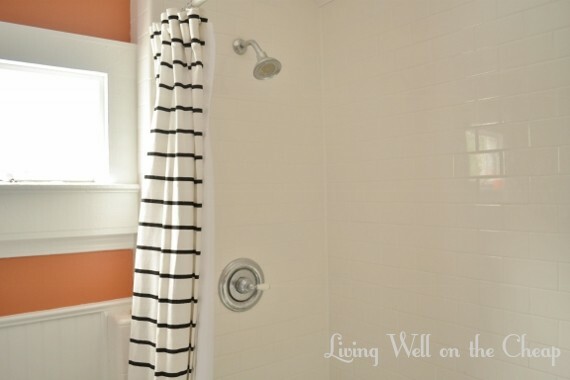 They added a shower and gleaming white subway tiles installed by Laurie herself, along with the floor. Color me impressed. The master bedroom gets this great lazy morning light. 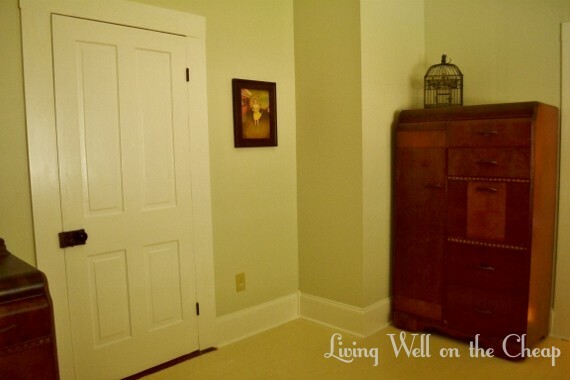 The floors were really bad in here, so they painted them, and moved some things around to create a deeper closet. 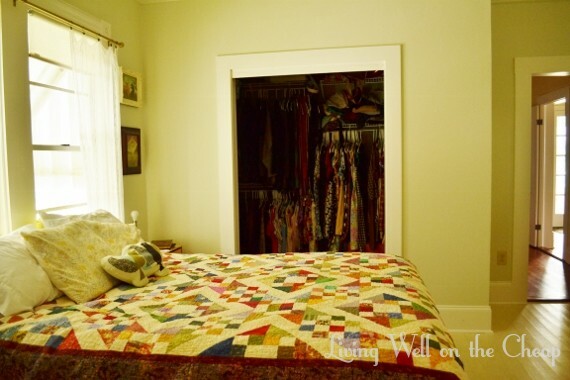 How perfect is that quilt? 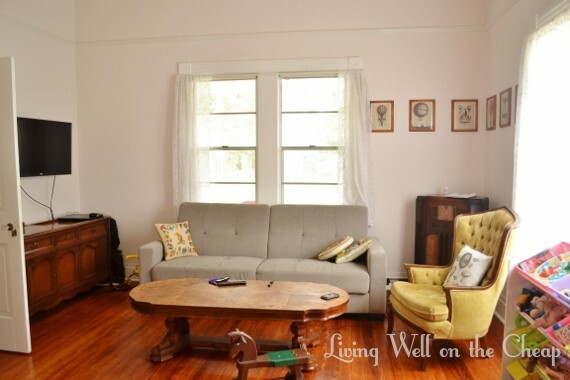 I feel like this space is so classically and authentically Southern. 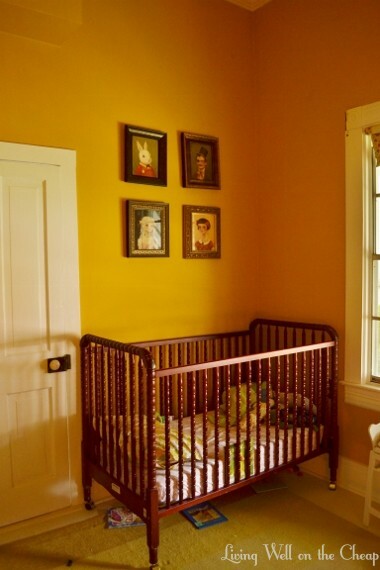 Can’t you see one of Kate Chopin’s characters sleeping here (or, less classic, Sookie Stackhouse or Skeeter Phelan)? I wish I could have gotten all of her beautiful antique furniture in one shot. The house was originally four bedrooms with one bath, but they broke up one of the bedrooms to make room for a second bath and a laundry nook. 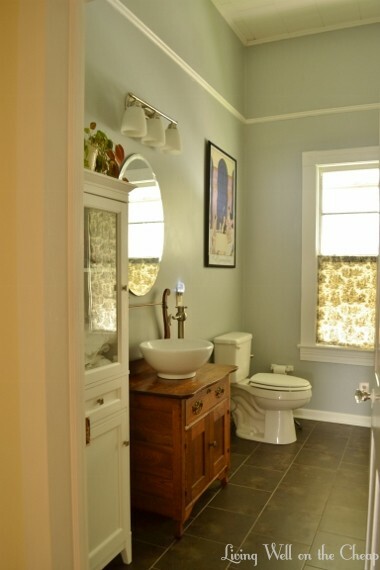 This bathroom is all new, but doesn’t it look like it could’ve been there all along? 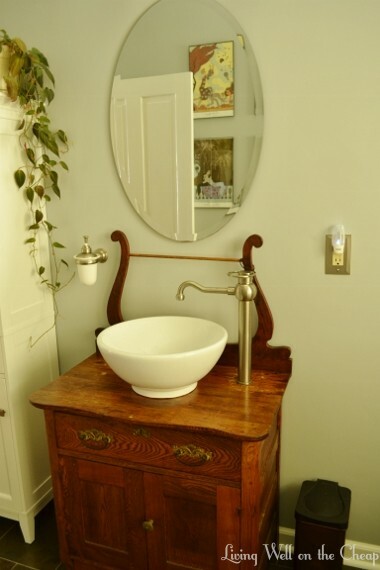 I am not a big fan of the vessel sink in my downstairs bath because I don’t think it matches the style of my house, but this setup would be right at home. So pretty and classic. More amazing tile work from Laurie and her husband. 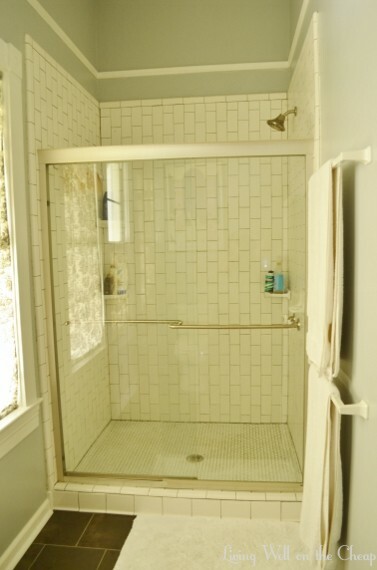 I love the look of white tile with dark grout. This is such a soothing space! 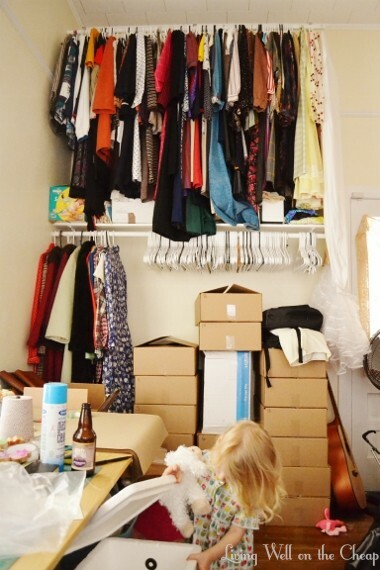 Laurie has an Etsy shop where she sells vintage clothing–she actually was a blog sponsor for a while–and she uses the third bedroom as her office. Floor to ceiling vintage dresses! I am so inspired by the work that Laurie and Trent have done, especially with a toddler underfoot. Nothing looks DIY’d in this house. If it were in my neighborhood it would probably sell for half a million dollars, but since it’s so far out of town it’s a steal. If you’re looking to move to small town Louisiana maybe you can buy Laurie’s house! Thanks again, Laurie, for letting me come snap some photos! These are great pics!!!! Great writing too! 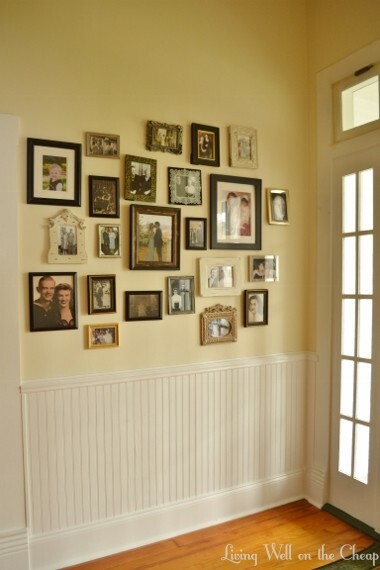 I love all of these photos, but I have to say, the stove/dining room photo took my breath away! I have a soft spot in my heart for 50s style kitchens, and I just can’t get over the tile floor with that red dining table in the breakfast nook! What a gorgeous house! So much love! Tell her she needs to blog in her new house so we can all learn from her! Thanks for sharing. Your friend’s home is lovely. It looks like Laurie and her hubby have been excellent caretakers of this house’s special heritage. I hope it is snapped up fast, and that they find a like-minded buyer who will honor the legacy they’ve revived so well.